This is a relatively quiet quarter of Bombay’s historical centre, sandwiched between the commerce of Dadabhai Naoroji Road (formerly Hornby Road) and the green triangle of Azad Maidan (formerly Bombay Gymkhana Maidan). 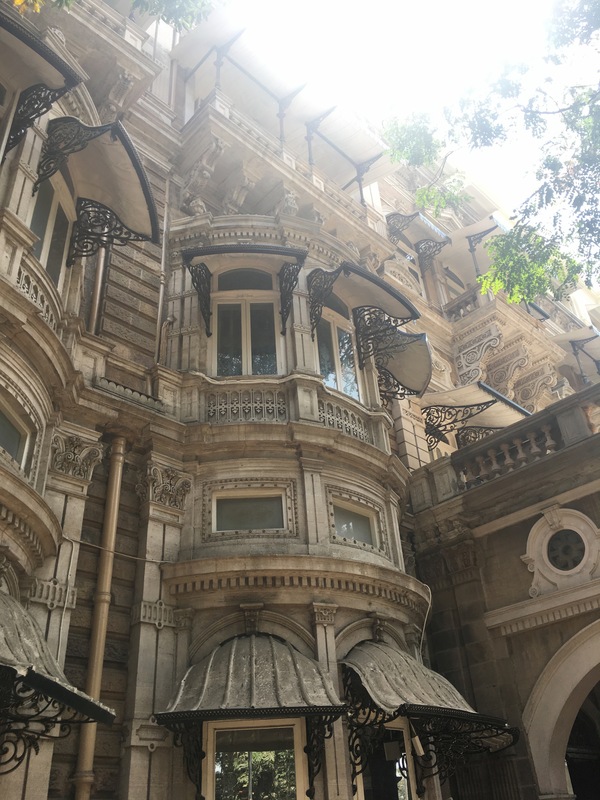 Esplanade House, the sumptuous home of the industrialist J.N. Tata, built in 1887, is only a block away. It and many other buildings here, including the Parsi Lying-in Hospital and the J.B. Petit School for Girls, attest to the contributions the Parsi community made to shaping this part of Bombay. We are here to find out more about where the exiled dancer Hilde Holger practiced, and where the Institute of Foreign Languages (IFL), founded by the exiled journalist Carl Petras (aka Charles Petrasch), was based. 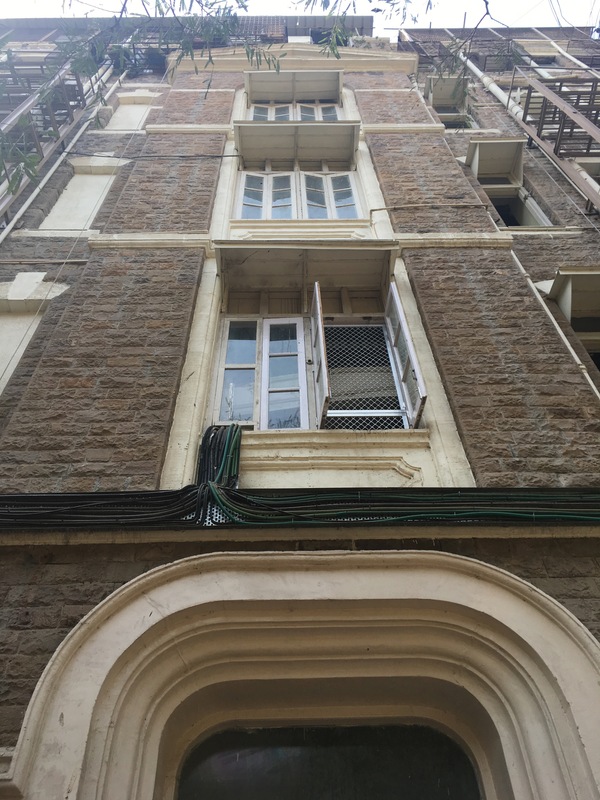 Hilde Holger lived and worked in a building on Prescott Road (currently Ghanshyam Talwatkar Marg). The road is lined with trees, yellow school buses and solid-looking, colonial-era buildings. Constructed of dressed stone, some of the structures feature Victorian Gothic pointed arches while others have more classical detailing. 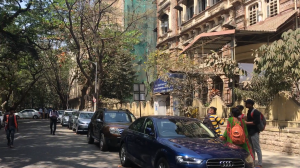 Today they accommodate schools and colleges (the road was named after a pioneer of girls’ education), a hospital, offices, residences, high-end retail, squash courts and an art gallery. Queen’s Mansion, the building in which Holger was based, is about halfway down the road. Built in 1902 as large flats, the floors were gradually taken over by commercial, cultural, and occasionally military uses. Apparently before Holger moved into her space on the second floor, it had been home to an income-tax office. And during World War II, the British military Field Intelligence Unit was run from the building. 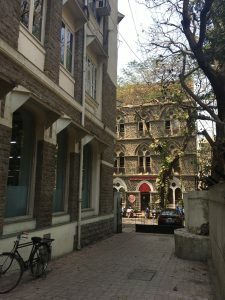 Her dance school, the School of Art for Modern Movement, opened in October 1941 and closed when she left India in 1948. 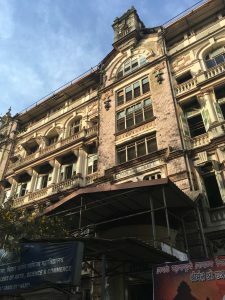 Chemould Prescott Road, one of Mumbai’s leading art galleries, has been located on the top floor of Queen’s Mansion since 2007. Interestingly, Chemould is an important institution in the narrative of exiled artists in this city. Its story began in Kekoo Gandhy’s framing shop on Princess Street (currently Shamaldas Gandhi Marg). 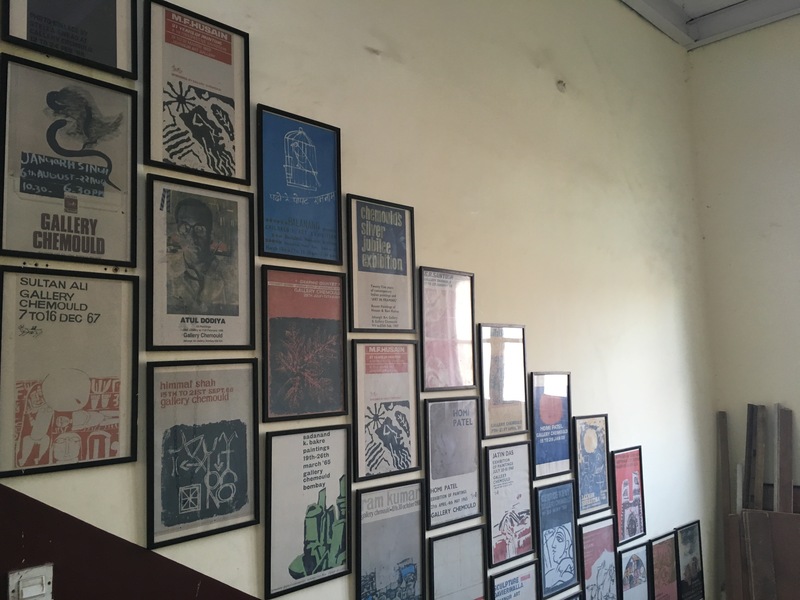 Founded in the early 1940s, Chemould Frames quickly became an informal venue for exhibiting work by Bombay’s Progressive Artists’ Group as well as by exiled artists, including Walter Langhammer. 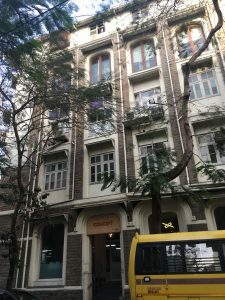 In 1963 Gallery Chemould opened in the Jehangir Art Gallery in Kala Ghoda, remaining there until it shifted to its current, much larger premises. Staff in Chemould Prescott Road tell us that there are old people living on the roof of Queen’s Mansion who may remember the dance school. Accessible only by a narrow spiral staircase, completely separate from the main stairwell and the rest of the building, the large roof space is a revelation. A chain of single-room apartments frames a welcoming courtyard space that also houses the building’s water tanks. We talk to an elderly woman who has lived here for many years, while others look on. Although she does remember the dance school, she can’t recall any details. While talking, we notice a number of birds on the terrace. A one-winged egret walks across the mosaic tiles between the flowerpots and laundry. Dozens of kites circle overhead. This place is not just a residential community, it is also a bird sanctuary. The elderly women of the “Queen’s Mitra Mandal” [Queen’s Group of Friends], as this unique space is called, care for injured birds that are brought to them. A pulley system on the front façade allows them to hoist the birds (and other things) onto the terrace. It is quite touching that the building that gave refuge to Hilde Holger continues to provide shelter for other vulnerable beings. A window in one of the communal washing spaces on the roof opens a great view to the north. Past the Parsi Lying-in hospital, about 50m away, is the Menkwa Building (formerly Carlton House), where the IFL was located. It is easy, if perhaps not reasonable, to imagine Hilde Holger and Carl Petras waving to each other from the windows of their buildings. Petras established the IFL in 1946, following his release from a prisoner of war camp (Franz, 2015). 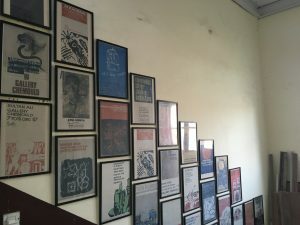 In addition to teaching languages and providing translation services, the IFL became a key exhibition space in Bombay, showing works by the Progressive Artists’ Group as well as by central European artists. An exhibition of the exiled painter Magda Nachman’s works opened at the IFL just hours before her death. 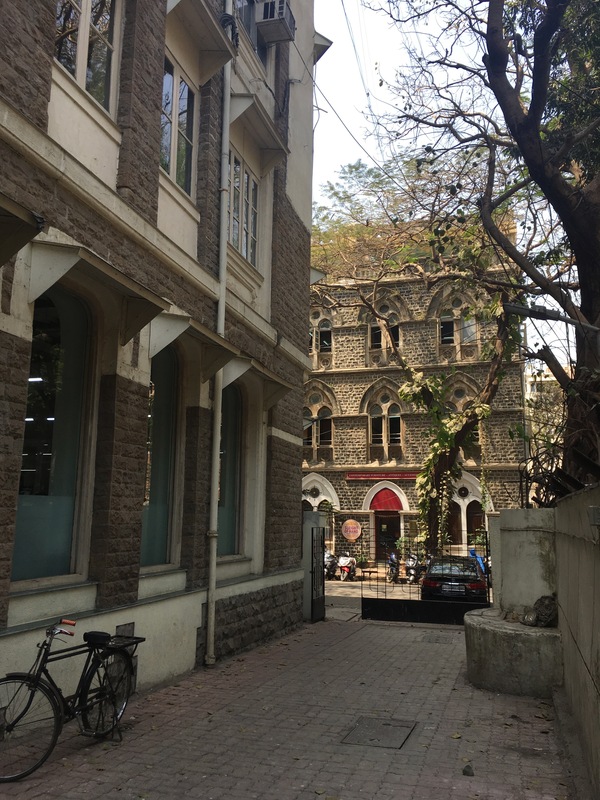 Around 1950, the IFL moved to premises next to the Indian Coffee House at Kala Ghoda, about one kilometre to the south, closer to Bombay’s art infrastructure. According to Petras it was, “a magnificent modern centre with tube lightening [sic] and much larger” (Franz, 2015: 259). Despite its success, the IFL seems to have closed shortly after Petras’ unexpected death in 1952. The Siddharth College of Arts, Science and Commerce, founded by Babasaheb Ambedkhar in 1946, moved into the Menkwa Building in 1951 and no trace of the IFL remains. Apart from Holger’s dance school and the IFL, I later learn from an interview with Jini Dinshaw, a life-long resident of the area, that in the 1940s the Hanova sisters from Czechoslovakia gave dance classes at the Alexandra Girls’ School, just around the corner from Prescott Road. And after Hilde Holger left Queen’s Mansion, another dance school moved in — run by Lillian Bonall until 1958. 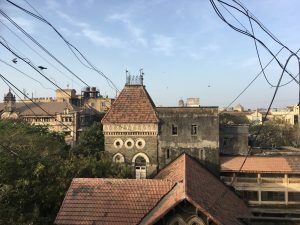 Although this neighbourhood was not at the centre of Bombay’s art scene in the 1940s, it was definitely at its fringes. 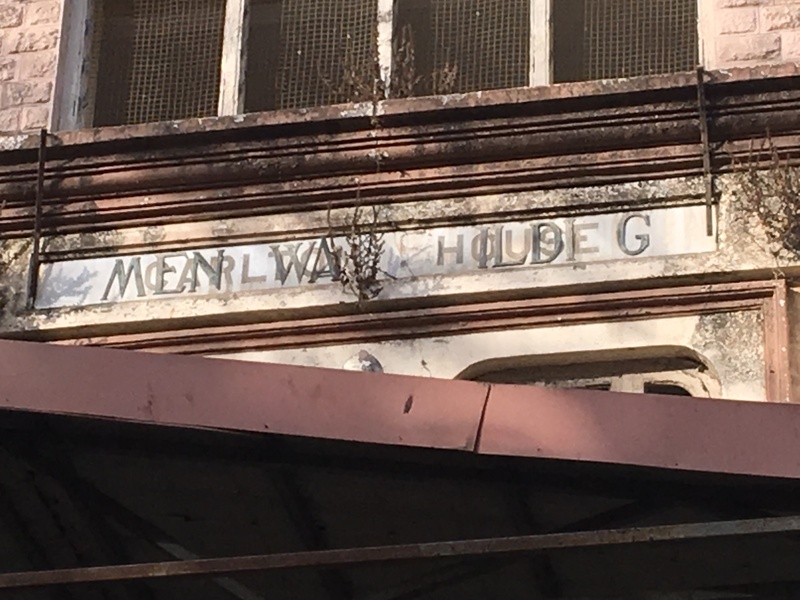 Moreover, it appears to have been a place where local and foreign migrant artistic cultures combined. 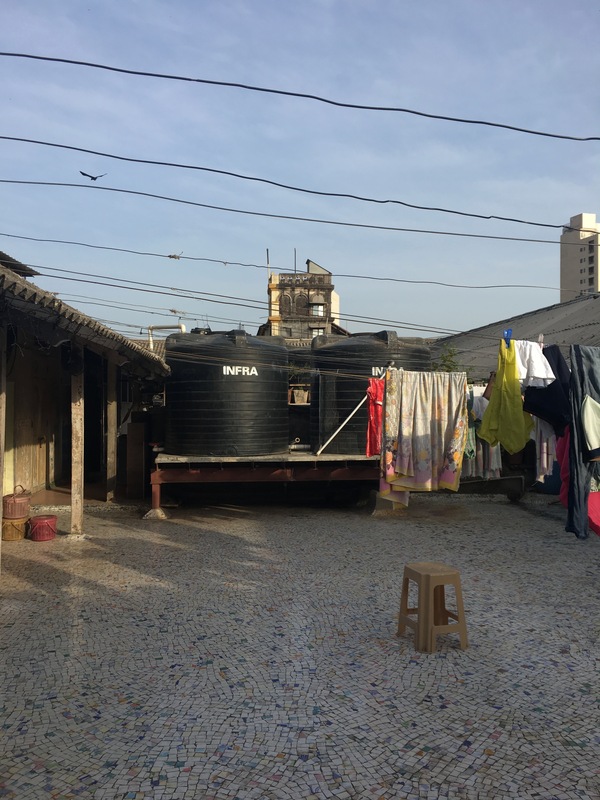 Many thanks to Gautam Muralidharan for participating in this fieldwork and for allowing me to publish his photos and videos. For more about what he usually spends his time doing, visit his website: https://oikos.co.in/. More of his videos are here. 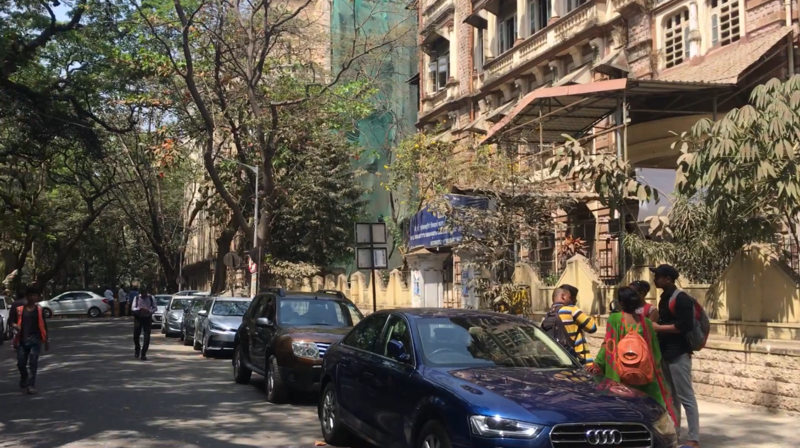 Thank you also to the residents of Queen’s Mansion, the staff at Chemould Prescott Road, the librarians at Siddharth College of Arts, Science and Commerce, and to Jini Dinshaw for taking the time to talk to us. Bombaywalla. ‘Oh Doctor, I’m in Trouble | Bombaywalla’. Accessed 3 April 2019. http://bombaywalla.org/signage-the-parsee-lying-in-hospital-1895/. ———. 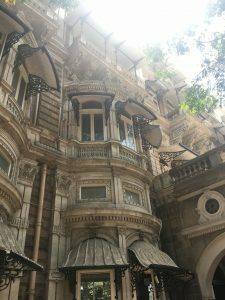 ‘Welcome to the Glorious Esplanade House | Bombaywalla’. 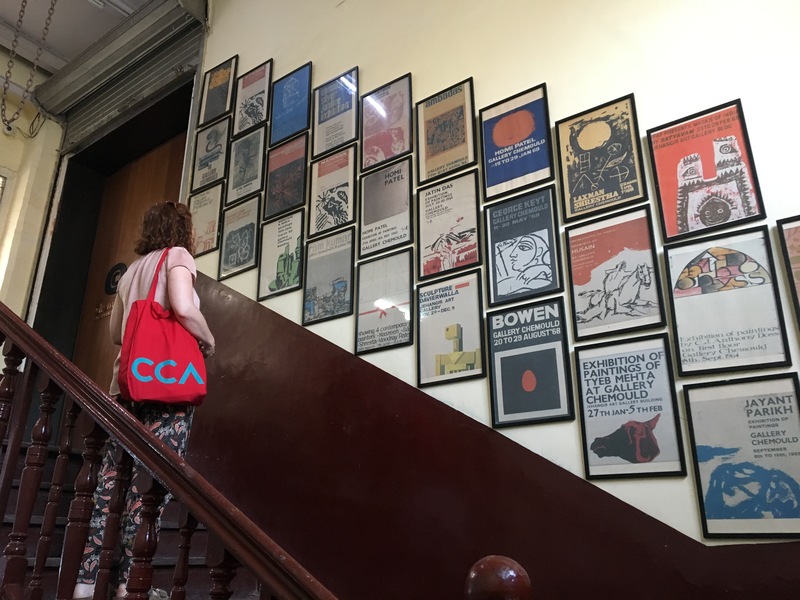 Accessed 3 April 2019. http://bombaywalla.org/interiors-esplanade-house-1887/. Chemould Prescott Road. ‘Gallery Chemould | About’. Chemould Prescott Road. Accessed 3 April 2019. http://www.gallerychemould.com/About/. Franz, Margit. 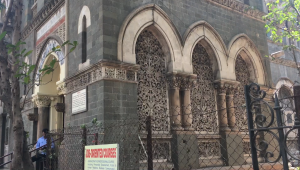 Gateway India: Deutschsprachiges Exil in Indien zwischen britischer Kolonialherrschaft, Maharadschas und Gandhi. 1st ed. Graz: CLIO Verein f. Geschichts- & Bildungsarbeit, 2015. Marfatia, Meher. ‘Here’s to You, Miss Prescott’. Mid-Day.Com, 10 December 2017. https://www.mid-day.com/articles/heres-to-you-miss-prescott/18811164.